Members of a Scottish mountain rescue team went to the aid of a runner in difficulties in the closing stages of an ultrarunning event dubbed ‘the most brutal race’. The Border Search and Rescue Unit had just been stood down from the search for missing boy Mikaeel Kular when they got the call to help a runner high on the Cheviot Hills who was close to completing the Montane Spine Race. The search for the Edinburgh child was halted after the discovery of his body at Kirkcaldy in Fife. BSARU was called out soon afterwards to rescue a runner on the border ridge. Team members spoke of their satisfaction of successfully helping the competitor from the hills after the tragic events preceding the rescue. Spokesman Damon Rodwell said BSARU members were joined in the search for Mikaeel by Tweed Valley and Ochils Mountain Rescue Teams. Mr Rodwell was involved in the search for Mikaeel and the subsequent rescue of The Spine runner. 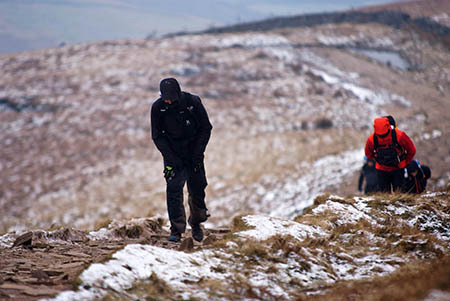 The race involves the full 431km (268-mile) length of the Pennine Way from Edale to Kirk Yetholm in winter conditions. He said: “”One of our members, a keen ultra-distance runner, had travelled directly from the Edinburgh search to Kirk Yetholm to greet runners at the end of their titanic challenge on the Spine Race. “At about half-past midnight on the Saturday morning one of the tail-enders activated the SOS function on the GPS tracker that all participants carry. “Bearing in mind that the runner had covered more than 250 miles over rough country in the past week, his position at 619m above sea-level in an exposed spot and the damp, chilly weather, it was clear that speed would be an important factor in rescuing the casualty before he succumbed to hypothermia. “A helicopter was dispatched from RAF Boulmer in Northumberland, but was prevented from landing on the high summit by low cloud and poor visibility. “BSARU was deployed to find and evacuate the exhausted 49-year-old on foot. “Leaving from Cocklawfoot at around 4.30am on Saturday, a hasty-party of two made good time up Windy Rig to Windy Gyle by the light of a bright moon in a clear sky. “The air temperature was hovering around freezing, which helped with the speedy ascent but made it imperative to reach the casualty as quickly as possible. Depleted of reserves and unable to keep warm by moving, he would be losing heat rapidly. “The advance pair found him without difficulty, lying in a slight dip about 150m south of the summit. “An experienced ultrarunner and a veteran of several severe endurance tests, he had done everything he could have to stave off the chill. He was on a foam mattress inside a waterproof bivvy bag, a sleeping bag and all his clothing. Mr Rodwell said while the rest of the rescue party made their way to Windy Gyle, equipped with further medical supplies and a stretcher in case the runner needed carrying off the hills, the runner was warmed with hot tea, a bivvy shelter and shared body heat, while the rescue was coordinated from a control trailer on the valley floor. Mikaeel Kular’s mother Rosdeep Kular has been arrested in connection with the death of the three-year-old. Police Scotland said the 33-year-old is expected to appear in Edinburgh Sheriff Court on Monday. Assistant Chief Constable Malcolm Graham said: “I would like to again recognise the overwhelming public assistance that Police Scotland have received during the course of this very complex investigation. “This includes his family and friends, with whom our thoughts remain. “Over 200 civilian volunteers joined the search for Mikaeel within the Pennywell, Muirhouse and Silverknowes areas during adverse weather conditions and cold temperatures. “In addition, our dedicated number received in excess of 500 calls, with people wishing to provide information to help establish Mikaeel’s whereabouts. “I would like to extend my sincerest thanks to you all for your vital support. The Montane Spine Race was won by Czech runner Pavel Paloncy in a record time of 4 days 14hrs 44mins, arriving at Kirk Yetholm at 11.11pm on Wednesday.